Assume that inflation is stable, there is excess productive capacity, and the central bank maintains its current monetary policy setting. In this situation, if government spending increases by $X dollars and private investment and exports are unchanged nominal income will continue growing until the sum of taxation revenue, import spending and household saving rises by more than $X dollars because of the multiplier. This question relates to the concept of a spending multiplier and the relationship between spending injections and spending leakages. We have made the question easy by assuming that only government spending changes (exogenously) in period one and then remains unchanged after that. Aggregate demand drives output which then generates incomes (via payments to the productive inputs). Accordingly, what is spent will generate income in that period which is available for use. The uses are further consumption; paying taxes and/or buying imports. We consider imports as a separate category (even though they reflect consumption, investment and government spending decisions) because they constitute spending which does not recycle back into the production process. They are thus considered to be “leakages” from the expenditure system. So if for every dollar produced and paid out as income, if the economy imports around 20 cents in the dollar, then only 80 cents is available within the system for spending in subsequent periods excluding taxation considerations. However there are two other “leakages” which arise from domestic sources – saving and taxation. Take taxation first. When income is produced, the households end up with less than they are paid out in gross terms because the government levies a tax. So the income concept available for subsequent spending is called disposable income (Yd). To keep it simple, imagine a proportional tax of 20 cents in the dollar is levied, so if $100 of income is generated, $20 goes to taxation and Yd is $80 (what is left). So taxation (T) is a “leakage” from the expenditure system in the same way as imports are. Finally consider saving. Consumers make decisions to spend a proportion of their disposable income. The amount of each dollar they spent at the margin (that is, how much of every extra dollar to they consume) is called the marginal propensity to consume. If that is 0.80 then they spent 80 cents in every dollar of disposable income. So if total disposable income is $80 (after taxation of 20 cents in the dollar is collected) then consumption (C) will be 0.80 times $80 which is $64 and saving will be the residual – $26. Saving (S) is also a “leakage” from the expenditure system. It is easy to see that for every $100 produced, the income that is generated and distributed results in $64 in consumption and $36 in leakages which do not cycle back into spending. For income to remain at $100 in the next period the $36 has to be made up by what economists call “injections” which in these sorts of models comprise the sum of investment (I), government spending (G) and exports (X). The injections are seen as coming from “outside” the output-income generating process (they are called exogenous or autonomous expenditure variables). For GDP to be stable injections have to equal leakages (this can be converted into growth terms to the same effect). The national accounting statements that we have discussed previous such that the government deficit (surplus) equals $-for-$ the non-government surplus (deficit) and those that decompose the non-government sector in the external and private domestic sectors is derived from these relationships. The question then is: what would happen if government increased spending by, say, $100? This is the terrain of the multiplier. If aggregate demand increases drive higher output and income increases then the question is by how much? The spending multiplier is defined as the change in real income that results from a dollar change in exogenous aggregate demand (so one of G, I or X). We could complicate this by having autonomous consumption as well but the principle is not altered. So the starting point is to define the consumption relationship. The most simple is a proportional relationship to disposable income (Yd). So we might write it as C = c*Yd – where little c is the marginal propensity to consume (MPC) or the fraction of every dollar of disposable income consumed. We will use c = 0.8. Our tax relationship is already defined above – so T = tY. The little t is the marginal tax rate which in this case is the proportional rate (assume it is 0.2). Note here taxes are taken out of total income (Y) which then defines disposable income. Thus k = $179/$100 = 1.79. This says that for every dollar the government spends total real GDP will rise by $1.79 after taking into account the leakages from taxation, saving and imports. But the important point is to understand why the process generates a multiplier value of 1.79. Here is a spreadsheet table I produced as a basis of the explanation. You might want to click it and then print it off if you are having trouble following the period by period flows. So at the start of Period 1, the government increases spending by $100. The Table then traces out the changes that occur in the macroeconomic aggregates that follow this increase in spending (and “injection” of $100). The total change in real GDP (Column 1) will then tell us the multiplier value (although there is a simple formula that can compute it). The parameters which drive the individual flows are shown at the bottom of the table. Note I have left out the full period adjustment – only showing up to Period 12. After that the adjustments are tiny until they peter out to zero. Firms initially react to the $100 order from government at the beginning of the process of change. They increase output (assuming no change in inventories) and generate an extra $100 in income as a consequence which is the 100 change in GDP in Column . The government taxes this income increase at 20 cents in the dollar (t = 0.20) and so disposable income only rises by $80 (Column 5). Households spend 80 cents of every disposable dollar they receive which means that consumption rises by $64 in response to the rise in production/income. Households also save $16 of disposable income as a residual. Imports also rise by $20 given that every dollar of GDP leads to a 20 cents increase imports (by assumption here) and this spending is lost from the spending stream in the next period. So the initial rise in government spending has induced new consumption spending of $64. The workers who earned that income spend it and the production system responds. But remember $20 was lost from the spending stream so the second period spending increase is $44. Firms react and generate and extra $44 to meet the increase in aggregate demand. Eventually the process stops and income reaches its new “equilibrium” level in response to the step-increase of $100 in government spending. Note I haven’t show the total process in the Table and the final totals are the actual final totals. If you check the total change in leakages (S + T + M) in Column (6) you see they equal $100 which matches the initial injection of government spending. The rule is that the multiplier process ends when the sum of the change in leakages matches the initial injection which started the process off. 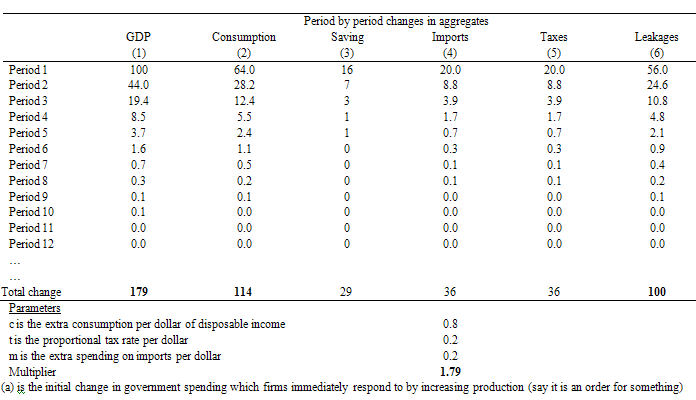 You can also see that the initial injection of government spending ($100) stimulates an eventual rise in GDP of $179 (hence the multiplier of 1.79) and consumption has risen by 114, Saving by 29 and Imports by 36. So while the overall rise in nominal income is greater than the initial injection as a result of the multiplier that income increase produces leakages which sum to that exogenous spending impulse. When a government such as the US government voluntarily constrains itself to borrow to cover its net spending position, it substitutes its spending for the borrowed funds and logically reduces the private capacity to borrow and spend. When the national government’s fiscal balance moves into deficit, we know that the government is trying to stimulate the economy. Typically, the NAIRU estimates are much higher than any acceptable level of full employment and therefore full capacity. The change of the the name from Full Employment Budget Balance to Structural Balance was to avoid the connotations of the past where full capacity arose when there were enough jobs for all those who wanted to work at the current wage levels. I have some questions about the leakages in question 1. First on taxation- most of the taxes I pay are to state and local government- which in turn spends them back into the economy. Why is that considered a leakage? Imports- is it reasonable to assume the exporting company or country that provides what I import does not spend any of the fiat currency I pay them back into the country I live in? Saving- I understand that if I stick my savings in a box in the basement that savings is lost to the economy until I eventually spend it. But what if I bought shares in the stock market or put it in a bank that then used it as cheap funding for its loans? So I am proposing that the sum of total savings, imports, and taxes can actually, and almost certainly will, exceed the amount of the initial government increase in spending- just like the question asks. They just are not complete leakages. Had the question asked that if when the ‘leakages’ amounting from taxes imports or savings added up to more than the initial spend is that when the stimulus stops- then the correct answer might be “False”. But it didn’t. So the answer should be ‘True’ and I will award myself the coveted title of ‘MMT Friend of the People’ once again. The answer to Question 1 is an illustration of what MMT says will happen “if government spending increases by $X dollars” etc. How well does this answer comport with what actually happens in cases that more or less fit the idealized conditions of the question? F. Thomas Burke, the spending multiplier and its effects are not particular to MMT. I learned them years ago in econ 101. How well they hold up is the subject of some debate by economists that fantasize about ‘Ricardian Equivalence’ effects, which goes sort of like people see the government spending more so they think they will have to pay more taxes eventually, so they just save all the extra spending in order to pay the imagined eventual tax increase. Which is complete baloney. Everybody else pretty much thinks the answer fits pretty well with reality. I think it does also. when foreigners spend some of their income from selling to Americans back into the American economy that spending will show up automatically as part of the “export” income of Americans. Am I right? Bill, I wonder if it is proper in today’s America to assume a saving rate of just 20%. Yes, this may apply to households, but does it apply to the Corps that get a lot of Gov. spending directly and even more indirectly. . . So, I’ll illustrate this with just looking at direct payments to individuals and payments to defense contractors. I think $100 payed to people will mostly be spent at Walmart and that Walmart pockets 80% of the increase and pays just 20% more to its workers. I think Walmart gives the 80% to its top executives and shareholders who spend just 10% of it, thus saving 90% of it. . . For every $100 in increases in Gov. payments directly to people, $300 goes to defense contractors and they behave like Walmart, that is, they give just 20% more to their workers and pocket 80% for their top execs and shareholders, who also save 90% of that new income. . . Yes, I know the percentages are just rough guesses on my part. Feel free to change them to your guesses. I’m sure your guesses are more accurate than mine. However, please explain where my thinking is off base. Thanks, Bill. Jerry Brown writes “the spending multiplier and its effects are not particular to MMT. I learned them years ago in econ 101. … Everybody else pretty much thinks the answer fits pretty well with reality. I think it does also.” It sounds good to me too. But who is “everybody else”? Apparently the people, politicians, and academic econ powers that be are not so accommodating. If Bill’s thought experiment relies in any way on principles of MMT (beyond using common econ 101 concepts) then it essentially makes a prediction. As a thought experiment, it is a simplified and idealized *model*. If its predictions are testable, then we should be able to devise/find other models in which key variables used to calculate the 1.79 multiplier are empirically measurable — models that, while messier, are constructible from real world data but that can be mapped more or less cleanly onto or into the thought-experiment model (say, some time span in Switzerland c. 1976, or Ohio c. 1992, or whatever, so long as there is a respectable approximate fit between the idealized model and the data model(s)). Even better, what predictions would other schools of economic theory make under the same idealized conditions as the thought experiment? Some might regard the multiplier to be a myth, but others might yield a different number. (Myself, I don’t really know.) But they all should be testable at once by the same data models. Whose numbers are closest to the actual data? OK, maybe this particular thought experiment is not the best example to use to make this point. But I would say that something like this needs to be spelled out if MMT is to be convincing to anyone not already in “the choir” (as it were). If some comparative tests like this have been done, I would surely appreciate hearing about them. Is it a mistake that the answer to question 1 is false. Everything you posted seems to suggest the statement is true or am I missing something?